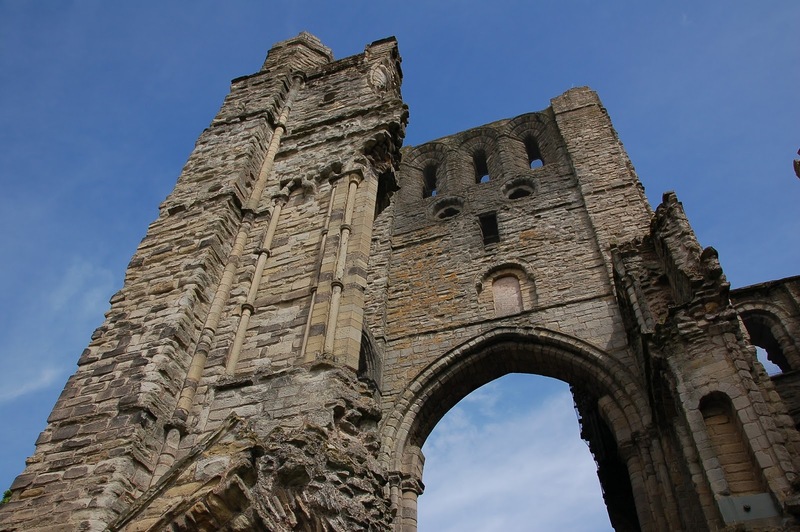 There are four 12th Century Abbeys in the Scottish Borders; positioned in the towns of Jedburgh, Kelso, Melrose and Dryburgh. You can visit them via the Abbeys Walk, which is a 64.5 mile journey, OR, you can be like me and take the car. It's not that I'm lazy, I just don't really have the time for that kind of walking commitment Plus, I don't want to turn up at my last abbey with the appearance of a woman who has just walked 64.5 miles. That's not a good look for me. I imagine most people do it in sensible chunks, over a period of several days. I drove. 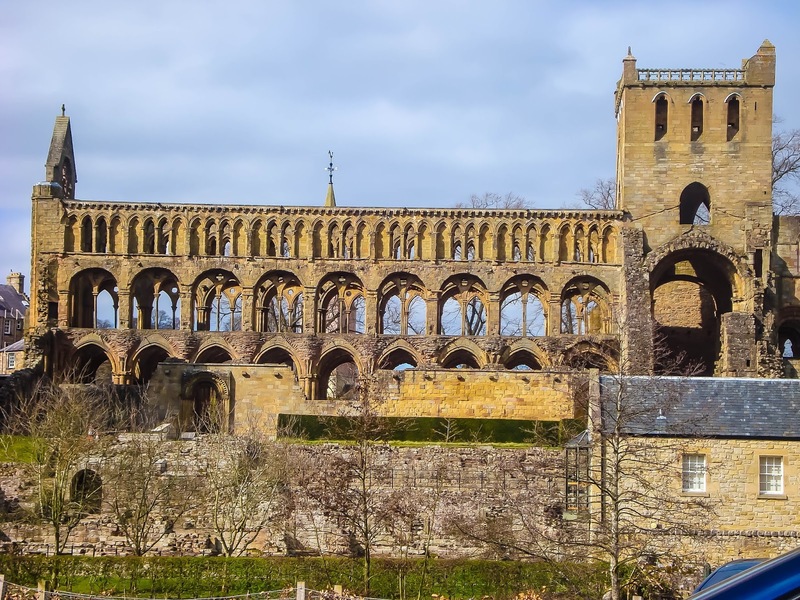 Three of the four abbeys (Jedburgh, Melrose and Dryburgh) have an admission charge and are all looked after by Historic Scotland. Kelso Abbey is also managed by HS, but this is free to enter as an unmanned site. Who needs a roof, anyway? Jedburgh Abbey lies furthest to the South, very close to the Scotland/England border. Its positioning here made it an obvious target for invaders. Also, it's so close to England that it probably cut down days of marching for somewhere to attack. I mean, it's only 10 miles away. You'd still be relatively fresh from your trip and you'd get there at a decent time of day. Why wouldn't you invade? Precisely. Anyway, English people don't attack it so much now. Historic Scotland have staff on site and they're clearly a huge deterrent. There's a free audio tour included in the admission price (£5.50 for an adult) and this will guide you through the main body of the Abbey and grounds. There's also a great visitor centre, herb garden and museum room on site. 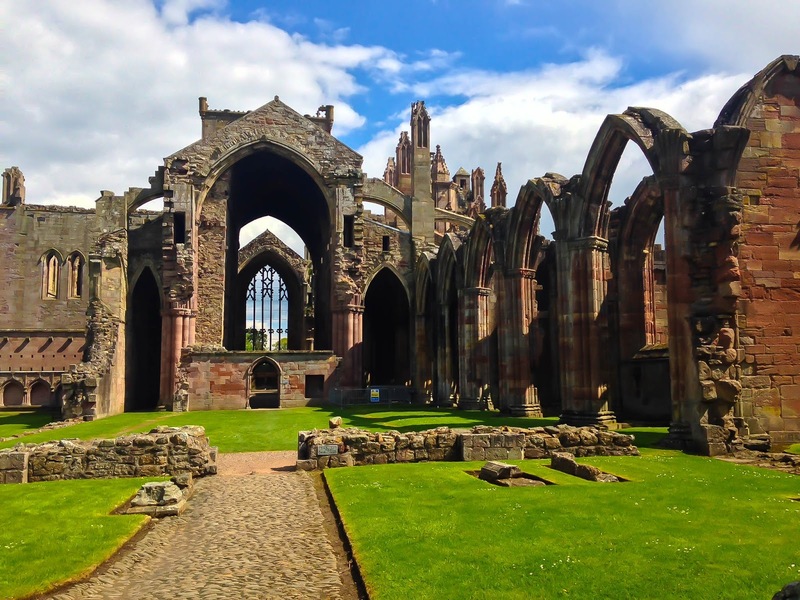 Melrose Abbey is my personal favourite. Possibly because it's the only one I've managed to visit on several occasions when the sun's been out. Honestly, it does happen. Melrose Abbey is famous as being the resting place of the heart of Robert The Bruce. The rest of him is buried in the Abbey at Dunfermline in Fife. I have no idea why, but feel free to Google it, if you like. Melrose Abbey, like others, is built in the shape of a cross and is gothic in style. The town was developed around the building and, like the other Borders Abbeys, it was partially destroyed (on more than one occasion) by English armies. They seem less interested in setting fire to it these days, and that can only be a good thing. In addition to the Abbey, its graves, inscriptions, gardens, and viewing tower, there is also the Commendator's House on site, which now serves as a Museum. 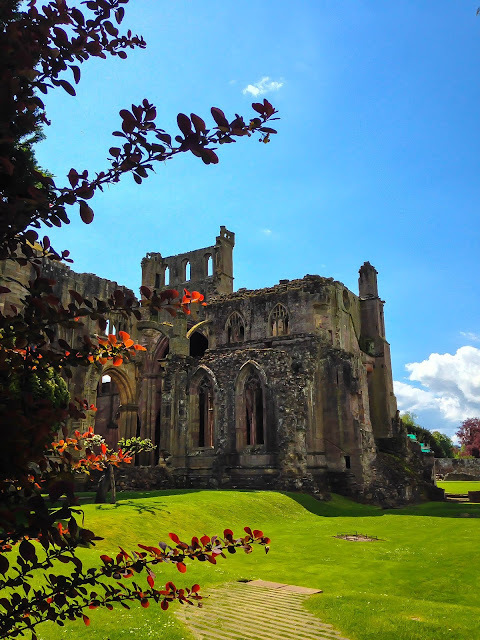 Within the Museum is an excellent display on Scottish author, Sir Walter Scott, who wrote about Melrose Abbey in his poem, The Lay of the Last Minstrel. 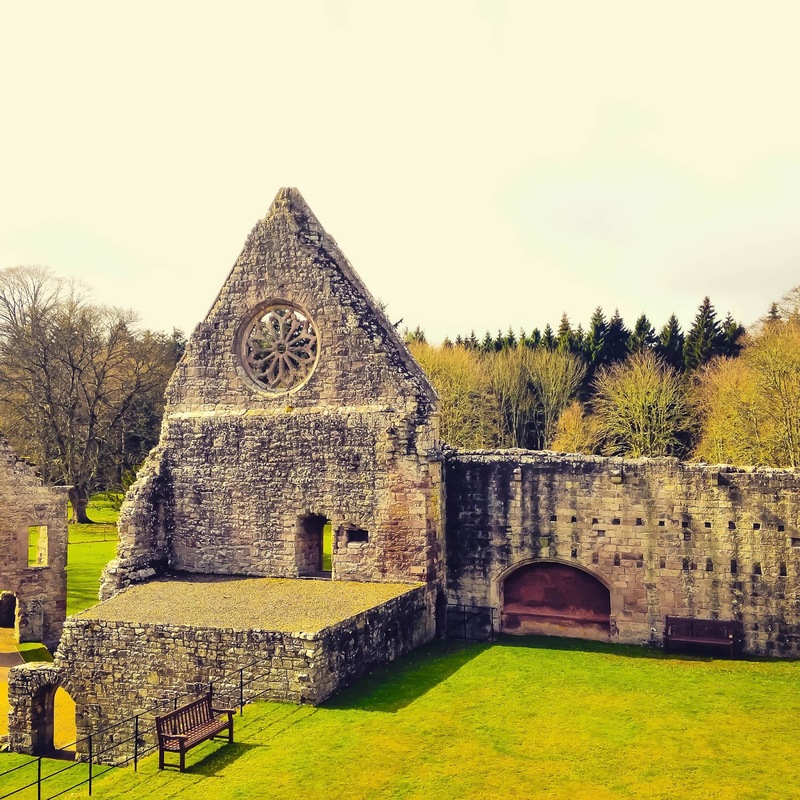 Dryburgh Abbey is the most remote of the Borders Abbeys in the sense that it sits outside the town of Dryburgh. Its location on the banks of the River Tweed does make it the most peaceful, though, and it is here that Sir Walter Scott was laid to rest. 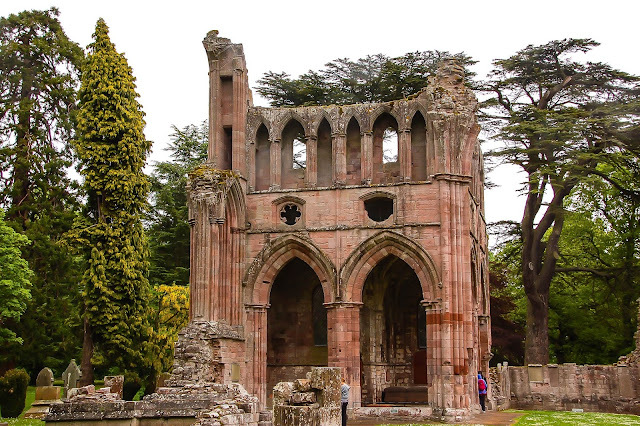 In a shock turn of events, Dryburgh was partially destroyed by English troops in 1322. They then sneaked around until we had rebuilt it and came back to make a mess in 1385. Imagine putting all that work in and sitting in your rebuilt Abbey only to have a look out the window to see all those troops heading your way. I'd be all like 'FFS....not AGAIN! Quick, Norbert, grab that lamp and RUN FOR IT! I'm fairly certain that's actually how it went. OK, so maybe not. Kelso Abbey exterior. Sweet, huh? Kelso Abbey is located smack bang in the middle of the town of Kelso, or at least where I think the middle is. It is an unmanned site and is free to enter. You don't have to run the gauntlet of being asked if you'd like to buy the latest copy of Historic Scotland's guide book, or feel like you should take the audio guide, despite the fact that you just pretend to listen to it so that the staff don't think you're only there to take pretty pictures. I have no idea why HS don't charge for the site as it's every bit as beautiful as the other three. Anyway, I'm not complaining about this, merely passing comment. Kelso Abbey has little of its floor plan remaining, but the walls of the West tower and north transept are in place and give you some indication of how beautifully grand the original abbey must have been. I won't bother telling you what happened to it as, by now, I'm sure you've worked it out for yourself. 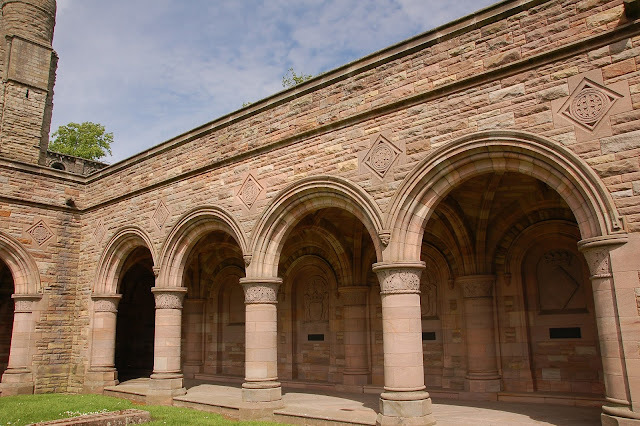 One of the best, and most surprising, aspects of Kelso Abbey is the Roxburghe Memorial Cloister. This was built in the early 1930's for the 8th Duke of Roxburghe, who was kind enough to hand over the remains of the Abbey to the people of Scotland. What a swell guy. All four abbeys are open throughout the year. Have you undertaken the 4 Abbey Challenge?